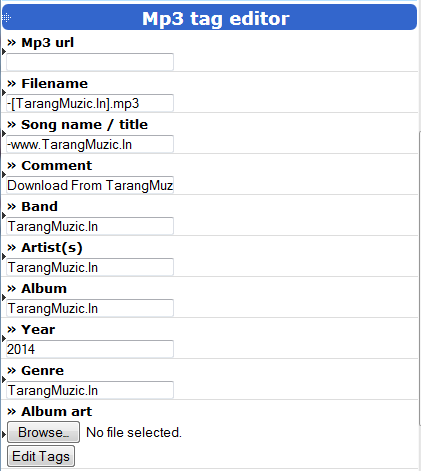 MP3 TAG EDITOR PHP SCRIPT FREE DOWNLOAD is easy to install. MP3 TAG EDITOR FOR WORDPRESS SITE is also the same with the above and this script can be used in Wordpress. MP3 TAG EDITOR PHP SCRIPT as the name implies is an online music tag editors for editing song information such as title, artist name, and genre, e.t.c. This is also an MP3 TAG EDITOR FOR WORDPRESS SITE. You can use it in your wordpress site. This is useful for bloggers that writes about entertainment and music. 1. Go to public_html or htdocs, upload and extract the file into the same directory (public_html) or htdocs. 3. Open Tag filder and locate index.php, edit it to your taste but don't change the codes. 4. Upload your image to the Tag folder but rename it to music.jpg and save. DOWLOAD MP3 TAG EDITOR PHP SCRIPT FOR WORDPRESS OR FOR ANY SITE OF YOUR CHOICE.